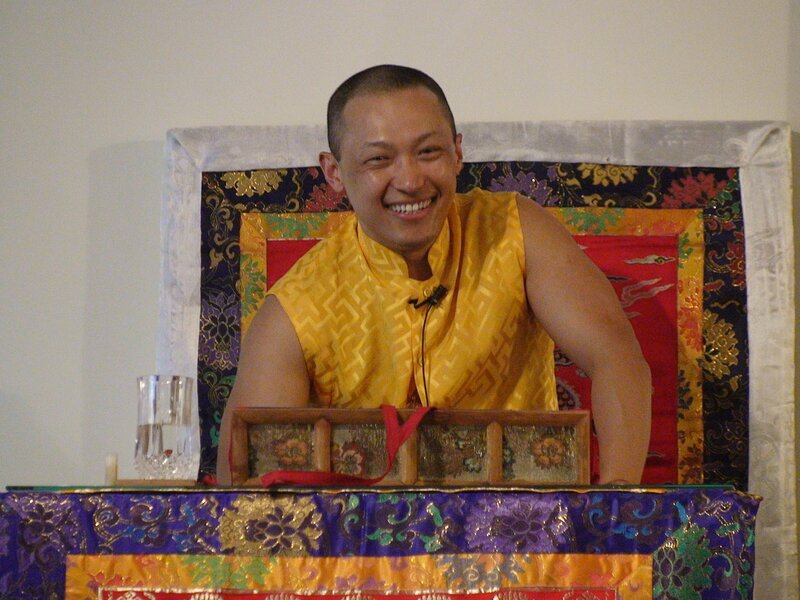 On May 9, the Baltimore and Washington, DC Shambhala Centers were blessed with an afternoon of teachings by Sakyong Mipham Rinpoche at the Baltimore Center. One month prior, David Brown had contacted Center Directors Jayne Sutton of DC and Julie Heegaard of Baltimore with the message that the Sakyong would come to Washington for a meeting with Queen Noor of Jordan and might be available for a visit with the two sanghas in Baltimore if there was enough interest. It took maybe three seconds before we responded with an unequivocal: YES! A week later, the visit was confirmed and both communities began a flurry of activity to prepare for the arrival. The Baltimore sangha put finishing touches on a Tenno room, creating a beautiful space to present to the Sakyong. We also built a new throne, appropriate for the holder of our lineage. And a big sign welcoming the Sakyong was installed in the front entrance. We had a total of three hours scheduled with the Sakyong, from 2pm-5pm. The Sakyong arrived a bit late, but then stayed until 7:30. During that time, he met with the two Center Directors, gave a talk to 120 advanced practitioners, met with 20 Bodhi School children, gave a talk to 100 newer members and friends, performed a blessing line, and met privately with a few individuals. For many in our communities, this was their first opportunity to connect with the Sakyong, and it was an extraordinary experience. The talks were riveting, both centering around how to properly balance personal practice with building community as the basis transforming society. During extended question periods after both talks, the sharing was open-hearted and the Sakyong’s answers were both loving and precise. Despite being tightly packed into the shrine room with no air conditioning in the sweltering heat, no one grumbled. The dralas had descended. The environment was magical. Everything was perfect. The Sakyong was here with us. What more could we possibly ask? The visit ended with the children making an offering of songs written by a sangha member and then a large crowd gathered on the front lawn to sing the Shambhala Anthem as the Sakyong departed from the Center. Afterward, there was a fabulous celebratory reception, prepared by Baltimore Sangha member Peter Manchiocci. Many participants from both Centers stayed on well into the evening, enjoying the glow of our time with the Sakyong, as well as connecting and re-connecting with new and old friends in our extended sangha. The visit was also special because it gave the DC and Baltimore Centers a chance to once again come together as a united sangha, to extend kindness and generosity to one another and to build the bonds between us. This year the Baltimore Bodhi School’s lessons focused on lineage. What a beautiful way to end the year – by bringing the lineage to life with a visit from the Sakyong himself! To celebrate his visit, Bodhi School children sang two songs for the Sakyong. “The Dharma Wheel Song” is an original composition written the inaugural year of Bodhi School as the class studied the eightfold path. 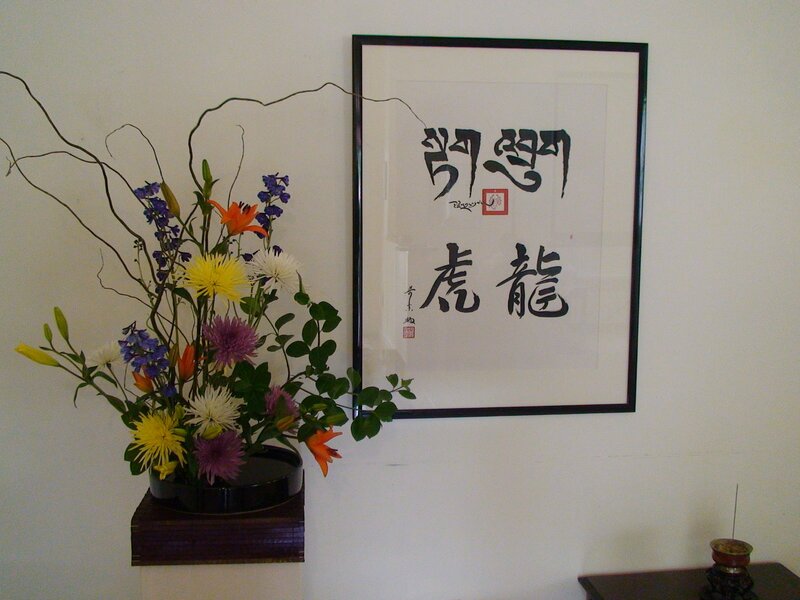 The children presented a CD of this song to the Sakyong, along with haiku poems they wrote about the four dignities. In a brief, sweet, and intimate audience, the Sakyong asked the children to read the poems aloud for him. The time I had at the Shambhala Center, during the second talk was inspirational. When I saw the Sakyong, I saw his wisdom. While I was sitting down listening to the Sakyong, I learned that meditation is a time to sit down and only focus on your breathing which is the beginning step towards the path of enlightenment. After that day I haven’t had any negative thoughts towards others because of the strength of my mind since the Sakyong talked to us about meditation. I have been coming to Bodhi School for 3 years and in those 3 years I have learned about the Sakyong and what he had to do in order to take his father’s place. I wanted to come to the Shambhala Center to receive the blessing from the Sakyong, because I know that his wisdom will help me in meditation and give me a better understanding of Buddhism. I enjoyed that day and the most important thing I learned is to locate your inner chi and use that to become enlightened. My visit to the Shambhala Center and seeing the Sakyong was unbelievable. I learned a lot about good posture and how to focus on your meditation. I could feel the unity in the room when the chanting began and the blessing at the end of the session. The Sakyong’s presence at the Shambhala Center and his input on life and meditation was an inspiration for all! I felt really grateful to share that moment with my family and friends of Bodhi School. I have a confession to make: after receiving the blessing from the Sakyong, I succumbed to curiosity and looked up at him for a moment. He was looking down at me with a slight smile and when our eyes met, there was a flash of what ground meant. He became the ground for the teachings yet at the same time, he was on the throne. It was a very odd juxtaposition. In the days since, I’ve tried to rationally think through what I saw and felt, but it still comes back to the very strong feeling that he is the ground, the ground for the teachings. 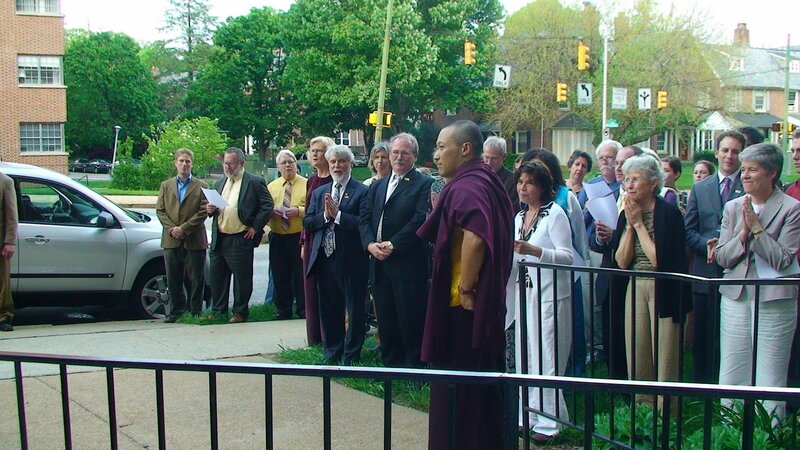 The visit of Sakyong Mipham Rinponche was a blessing, the preparations started way before his visit, the sangha of Baltimore and Washington, D.C. worked together making our Center beautiful embracing the feeling of devotion and love that our teacher represents. It has been a while since his visit but we still maintain the energy and love that he brought to us. 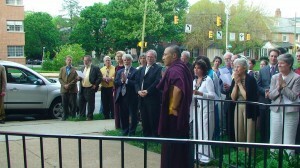 La visita de Sakyong Mipham Rinponche fue una bendicion , todo comenzo mucho tiempo antes de su visita la sangha de Baltimore y DC trabajaron juntas embelleciendo nuestro Centro de tal manera que se comenzo a sentir la devocion y amor que nuestro teacher representa . Aunque ya ha pasado tiempo de su visita todavia seguimos manteniendo la energia y amor que el nos trajo. The DC and Baltimore Dorje Kasung squads were delighted to join together as a single regiment to provide service for His Majesty during His visit. We offered our open-heartedness in order to ensure the Sakyong’s status, comfort and protection through our acts of mindful simplicity to details, elegance in performing public accompaniment and thoughtfulness in working with the public to inspire respect and gentleness for His Majesty. The participants at the Baltimore talk and the public in general, equally, were regarded by the Dorje Kasung as collaborators to the Sakyong’s gesture of Teaching and held with respect for their tenderness in acknowledging his Generosity. The Sakyong’s presence enriched our lives by enabling us to show our immense gratitude for this opportunity to create an enlightened society. What penetrated most deeply is what I have explored and practiced. With great generosity, compassion and precision, the Sakyong said “Manifest,” to embody the teachings. Manifest with complete confidence in the true nature of our minds and being. It is the essence of the 900 teachings of the Rinchen Terdzo. Choose and understand how to trust the true nature of mind, strengthen the mind, and MANIFEST. We need to trust our true nature. When we do the qualities of wisdom and compassion will be revealed, will manifest. Please practice; there is no other NOW, NOW, NOW, there is no other time, no later. When one practices, if one has confidence and understanding, then one will manifest. Please put others first. In humbleness, what is most profound is manifested with warmth and simplicity. Please accept this message from humbleness and joy. One incredible thing for me was that we drove 9 hours (about 3 hours longer than usual) through many traffic jams and I was feeling pretty downhearted about bringing Ceci [Catherine’s daughter] all that way only to have missed seeing the Sakyong. When we got there after 4 p.m. I saw a kasung who had been on duty (Francie Reed) and asked if the event was over, she said “no, you’re just in time.” And we were. It was fabulous. Ceci told me her favorite part was seeing old friends—I think she included the Sakyong in that group. She last saw him at SMC in 2005 (when she was 7). These songs sound great! Is it possible to get the lyrics and music for your Bodhi School song “The Dharma Wheel Song” and the rest of the lyrics to your “The Garuda Song.” This song was adapted from “The Lion Sleeps Tonight” . This would be geart for other centers’ Bodhi schools and for Family camps.